The life of our first Olympic champion in weightlifting ended tragically*. Trofim Lomakin was our first Olympic champion in weightlifting. At the 1952 Olympics in Helsinki, he won the gold medal with a huge advantage over his opponents. At the Olympics in Rome he won a silver medal. Lomakinn also won two World and three European titles. He was a five-time USSR champion and he broke five world records. The most interesting was that Lomakin was forced to do sports. As for him, he couldn't understant why it was necessary to get involved in this activity and what exactly sport was supposed to give him. He hated weightlifting. But Mother Nature gave Trofim a great gift - his outsatnding strength that predetermined his destiny. Trofim was born and grew up in Altai in the family of a gold prospector. When he turned 15, his father began to take him to the mountain river to pan for gold. The same as it was done by his grandfather and great grandfather. Apparently, Trofim's family was not lucky with gold panning. They lived in poverty. The whole village was involved in gold prospecting business. When his father died, Trofim was told that there was much more gold in Yakutia than in their area. Trofim and his brother decided to move to Yakutia. It took them two weeks to get to the Lena River and seven more days to reach Yakutsk. The last 300 kilometers they had to walk through the wild roads of Siberan taiga. That road for gold was long and difficult. On the contrary, Trofim's road to the Olympic gold was much easier and shorter. When Trofim served in the army, he was ordered to do weightlifting because he was much stonger than the best strongmen in his unit. That was the way it all began. At the Olympics in Helsinki the referees were biased. The Soviet team athletes easily lifted weights but the officials were finding some technical mistakes. The favorites at the tournaments were Americans. They were supposed to win. In his last lift, Trofim decided to lift the weight much heavier than it was needed to get a gold medal. The whole American team gathered near the platform. When Lomakin fixed the weight above his head, even Americans gave him a standing ovation. Lomakin remembers: "I was shoked by what happened, deafened by the applaudes that were getting louder and louder. I forgot that I had to put the weight down, that it's over and that I won." That was his biggest and brightest victory. After the Olympics in Helsinki, something strange started to happen with Lomakin. All of a sudden, he began to lose the competitions. The first time he lost, Trofim thought it happened by accident. After his second loss, Trofim thought it was due to his lack of focus. After the third time, Lomakin got scared. He began to train hard trying to reach his best shape. Hard training brought some results and Trofim began to win again. And then against any logic, he started to disappear from the gym. The rumors said that Lomakin befriended with the gold prospectors and that they wanted him as a specialist to cover their illegal sales. Then the trouble came. Lomakin was arrested and was sentenced for two year of jail time. Due to his former sports successes, Lomakin was soon released. Later, even his fame wasn't able to help him. His activities in the black market with the gold sales brought him back to the court. This time he received a much longer term. After he served his time in jail, Lomakin returned to Moscow. He started to see his old buddies. Most often, it involved heavy drinking. Then he disappeared again. No one knew what happened to him. On Monday, July 13, 1973, Trofim Lomakin was found dead near the Young Pioneers Stadium at Begovaya Station. A passerby found his dead body in the morning and called the police. Police investigation led to the conclusion that the ex champion was pushed down from the wall of the stadium. In the article by Tribuna, Trofim Lomakin was mistakenly named as the first Soviet Olympic Champion in weightlifting. 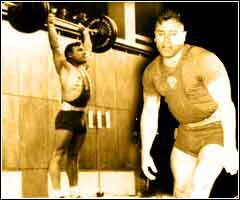 Ivan Udodov was the first Soviet lifter to win a gold medal at the Olympics.